Soften harsh sunlight and save with Hunter Douglas window fashions during the Celebration Of Light Savings Event! 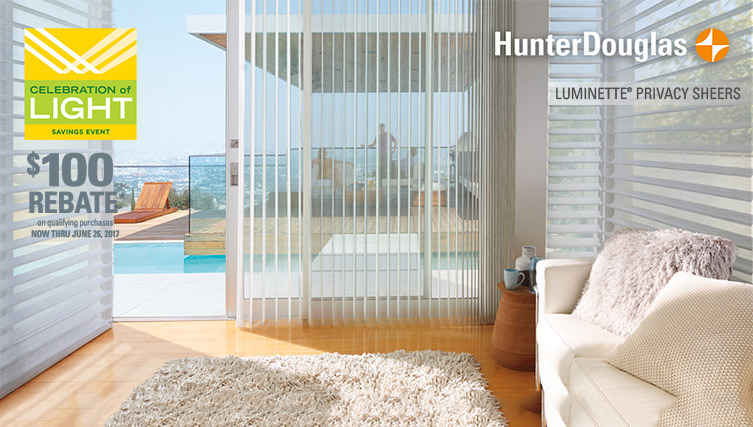 *SAVE $100 on qualifying purchases of light-transforming Hunter Douglas window fashions. Pirouette® shadings feature soft horizontal fabric vanes attached to a single sheer backing, allowing for enhanced views to the outside while maintaining privacy and the full beauty of the fabric appearance on the inside. Luminette®, Pirouette®, and Silhouette® are the beautiful way to celebrate light and save money. Stop by for your free consultation with our design team or schedule now below. *Manufacturer’s mail-in rebate offer valid for qualifying purchases made 4/15/17 – 6/26/17 from participating dealers in the U.S. only. For certain rebate-eligible products, the purchase of multiple units of such product is required to receive a rebate. If you purchase fewer units than the required multiple you will not be entitled to a rebate; partial rebates will not be awarded. Offer excludes HDOrigins and Nantucket™ Window Shadings, a collection of Silhouette® Window Shadings. Rebate will be issued in the form of a prepaid reward card and mailed within 6 weeks of rebate claim receipt. Funds do not expire. Subject to applicable law, a $2.00 monthly fee will be assessed against card balance 6 months after card issuance and each month thereafter. Additional limitations may apply. Ask participating dealer for details and rebate form. © 2017 Hunter Douglas. All rights reserved. All trademarks used herein are the property of Hunter Douglas or their respective owners.